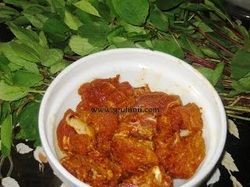 Clean mutton and add 2 tea spoons of ginger garlic paste, chiili powder, haldi powder and a tea spoon of oil. Add a cup of water and cook it in a pressure cooker for 6 to 8 whistles. Soak tamarind in warm water and make a thick pulp (around 2 table spoons). Heat 2 table spoons of oil in a pan. 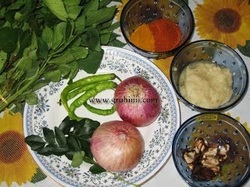 Add jeera, let it splutter add red chillies, chopped green chillies, garlic pods(mashed) and curry leaves. Cook for few sec. and add finely chopped onions. Fry until the onions turn pink and add half tea spoon of haldi to it. Stir and add the cooked mutton to it. 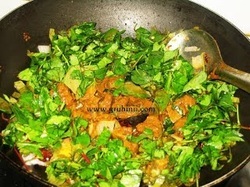 Stir and add the finely chopped sorrel leaves (gongura) to it. Add salt and cook for 2 to 3 mins add tamarind pulp and a cup of water to it. Cook in a low flame for 10 mins in a low flame until the curry is done.